I wanted to try my hand at making a seifuku for a school girl so that I could have a comfy cosplay for lazy Sundays at cons. 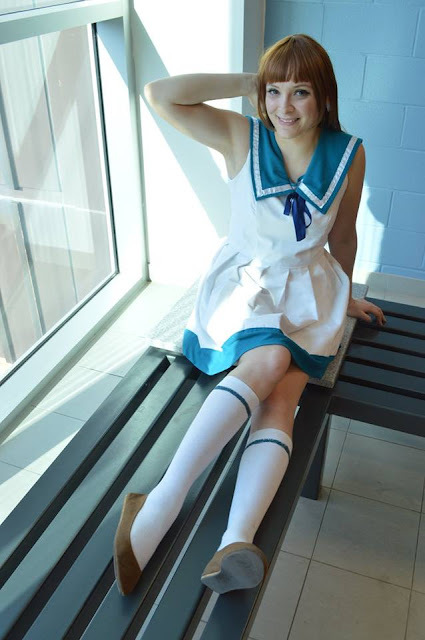 I chose to make Manaka's costume as my first one because she is such a cute character and I totally adored the series! I needed to show it some love, not to mention the costume was too cute to pass up! Dress - I started out with a simple dress pattern that consisted of a princess seamed bodice and a box pleated skirt. 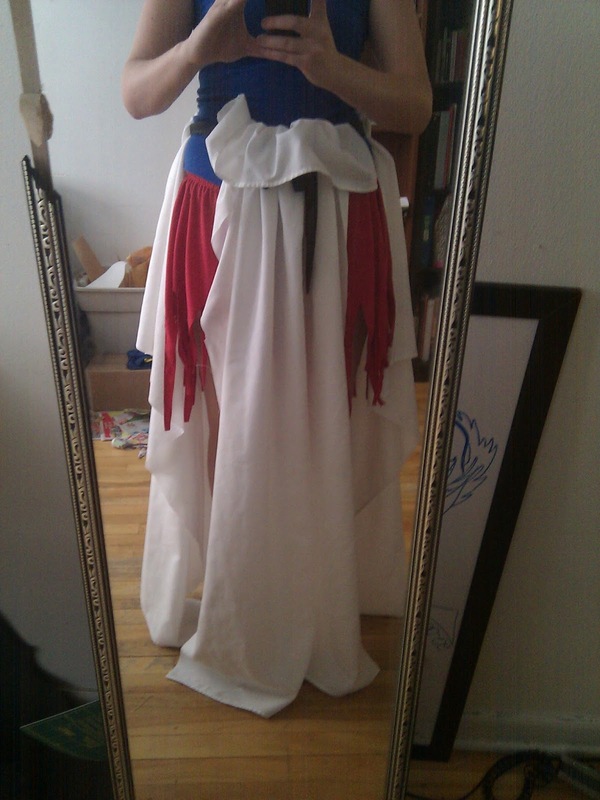 I modified the dress to have knife pleats instead of box pleats and to have a V-neck. The dress was made using a white fabric that was relatively heavy. The blue strip along the bottom as well as the blue sailor collar was made out of a knit fabric. The sailor collar was hand drafted and added to the dress before the lining for the bodice was sewn in. The dress closes with an invisible zipper located in a side seam. Socks - The socks took very little time to make, I just needed to paint the blue stripe along the top of the knee length white socks. Earrings - The earrings were made using white feathers and bobby pins. 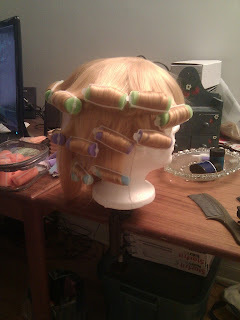 I don't have my ear pierced so all the character earring I make use bobby pins to fix them to the wig behind the ear. Wig - The wig was bought off of an eBay store. 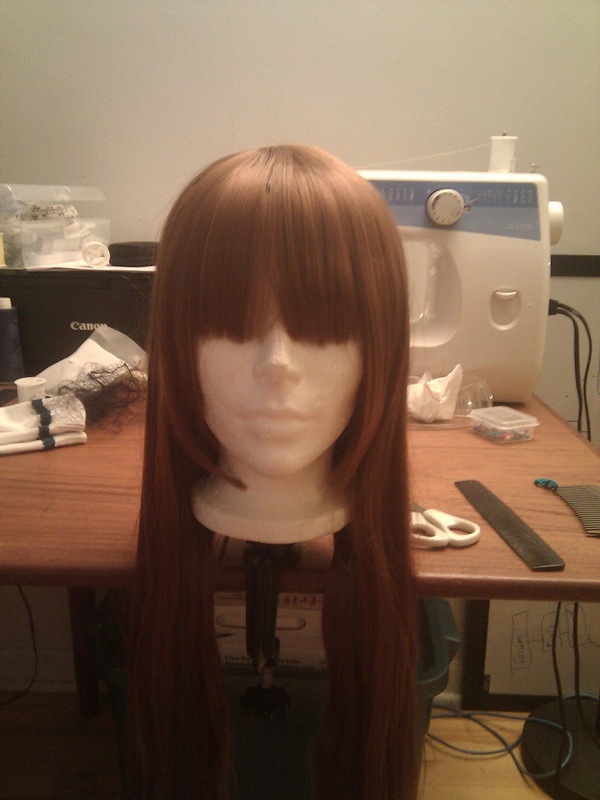 Her hair was pretty simple to make, I only needed to trim the bangs. Shoes - I wanted to try and find some brown Mary Janes for this cosplay but I was cheap so I just used my brown flats that I bought for "bare-footed" characters. 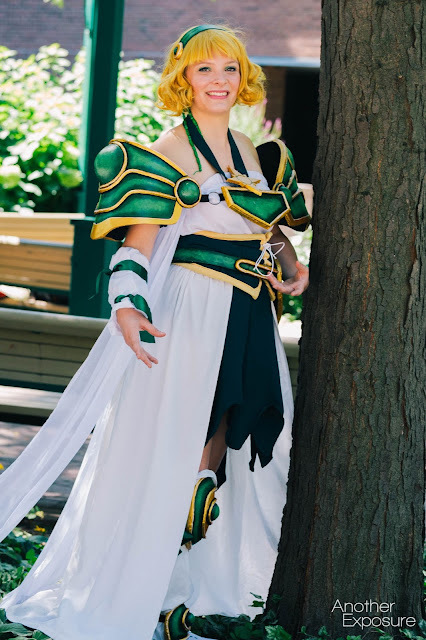 I really, really wanted to organize a Magic Knight Rayearth group so I gave a shout out to my friends and followers on Facebook. Bandit Spurs said that she would be totally down to cosplay as Umi and my friend Jen from uni said that she would be Hikaru. This was Jen's first costume so I offered to make it for her. Top - The top was pretty simple to make. It started out as a long rectangle where the length was twice the required length to wrap around her chest. 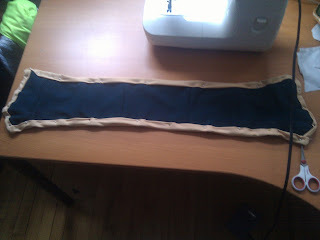 I sewed the two ends together to make a cylinder then marked a line three inches from the top. I folded the top edge down from that line and sewed a straight line an inch below the fold. An elastic that fit right above Jen's bust was placed right under the stitched line with the excess fabric turned under it to create the casing. Another line was sewn over the fold of the casing with the elastic helping to gather the fabric. 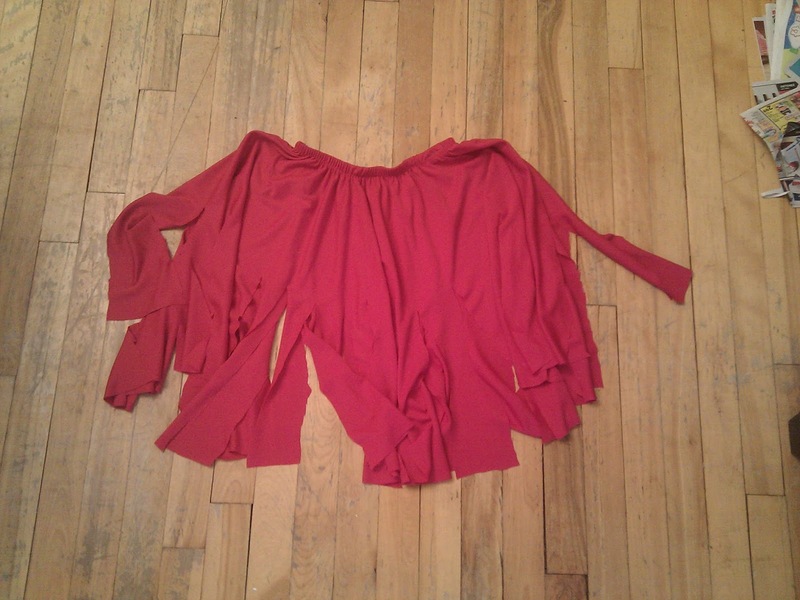 The red sash was made out of a long retangle with each edge rolled hemmed. 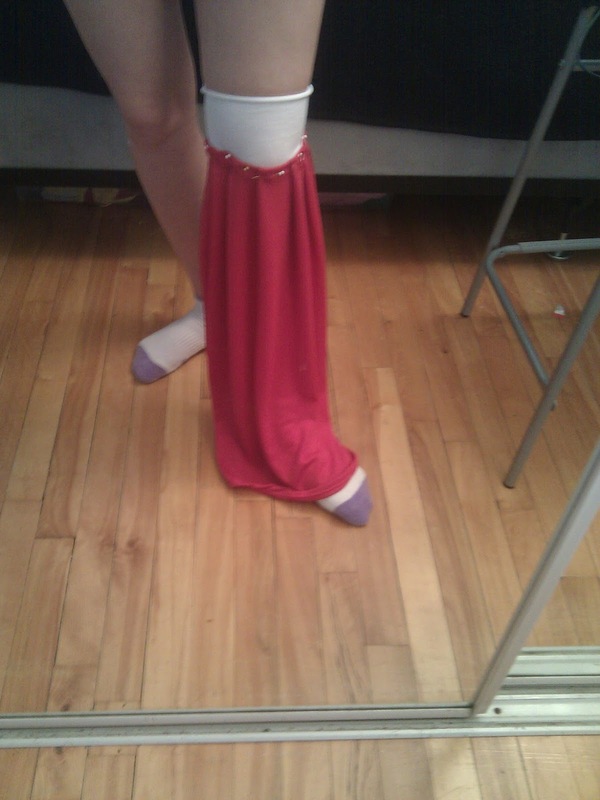 The top was hemmed and the sash was sewn on the right side of it. Skirt - A circle skirt was cut out from the red stretch fabric that fell to about the knees, unhemmed. A small elastic was sewn to the waist of the skirt and the bottom edge was slit multiple times to create a sort of fringe. The fringe was rolled hemmed so that each piece ended in a point. The fringe was cut evenly to mimic the artwork. Over Skirt - The over skirt consisted of two parts, the front piece and the back piece. 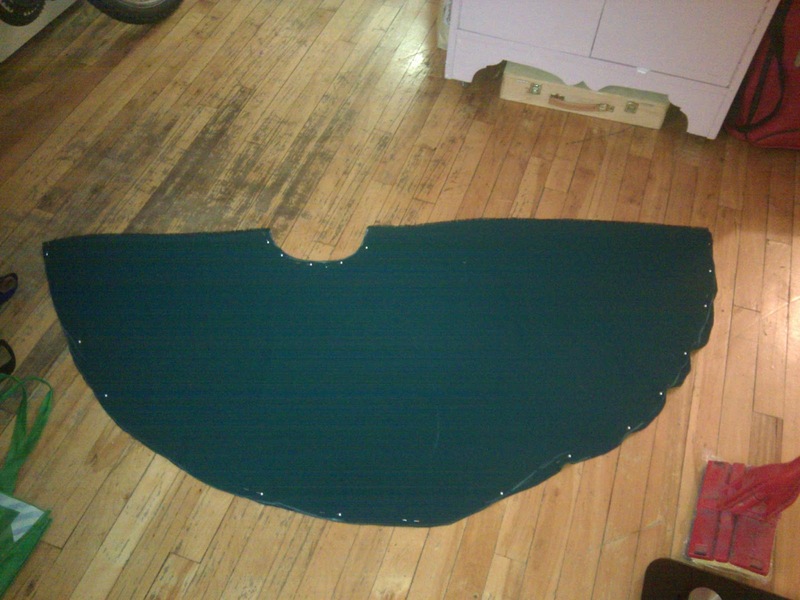 The front piece was made using a long rectangle that was hemmed on all edges. 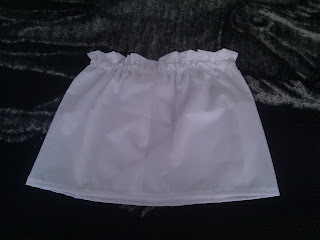 The top part was pleated and sewn in place before it was attached to the elastic that acted as the waist band. 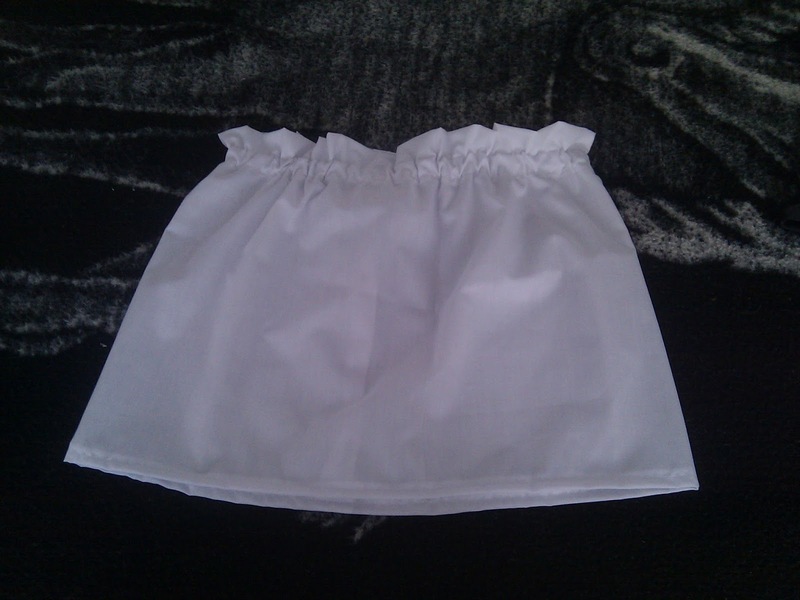 The back part of the skirt was not attached to the elastic but rather worn underneath it with the edges pulled up and over it. 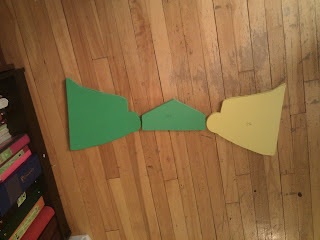 The back piece was also made using a large rectangular piece. Sleeve - The sleeve was pretty simple to construct. I took a rectangular piece of the white material, sewed it to form a cylinder, hemmed the bottom of the sleeve and turned over the top to sew an elastic casing. The red ribbons were sewn onto the seam at the top and bottom to form the ties. The ends of the ribbons were cut on an angle and fray checked. Boot Covers - The boot covers were made using a pair of knee length socks and the red material that was used for the skirt. The bottom part of the socks were cut off and a rectangle of the red material was pinned to the sock while I was wearing it. I hand sewed the red material in place, then hemmed it. 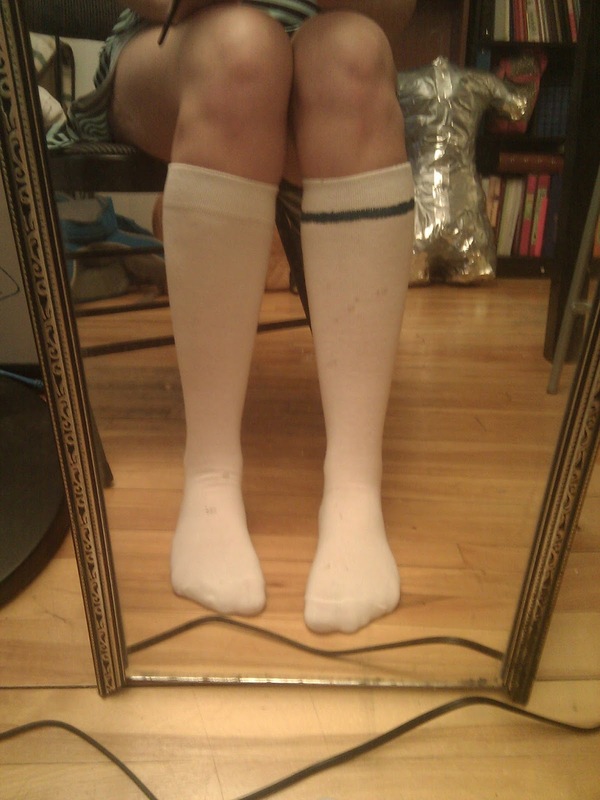 The purple ribbon was also hand sewn to the sock in the back. Pauldron - All the armour for this commission was made using EVA foam, contact cement and acrylic paints. 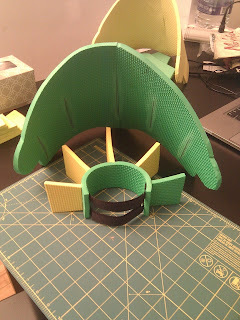 I started out by patterning the different pieces of the pauldron and playing around with different sizes until I got one that I liked. It was made in four pieces, the rounded top part, the "jewel", the piece under the jewel and finally the bottom part. I had to break it down into these components due to all the complex curves of the artwork. The pieces were glued, heat formed and assembled, with the details added on later. The round jewels on the side of the pauldrons were made using a Styrofoam ball cut in half. 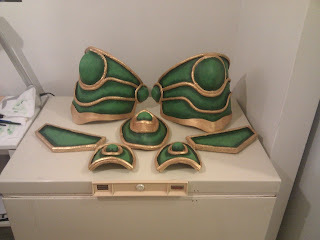 The large border details were made using EVA foam strips and the thinner details were made using hot glue to make a raised effect. It was then primed with Gesso and a layer of black paint. The colours were added in layers, first painting a base coat, then adding shadows and highlights using the dry brush method. I decided to use ribbon as a mean of attachments and to add a decorative flair. Cincher - The cincher was made using craft foam and paint, with a lace up front. The shape of the cincher was drawn out on newspaper, then scaled for size. 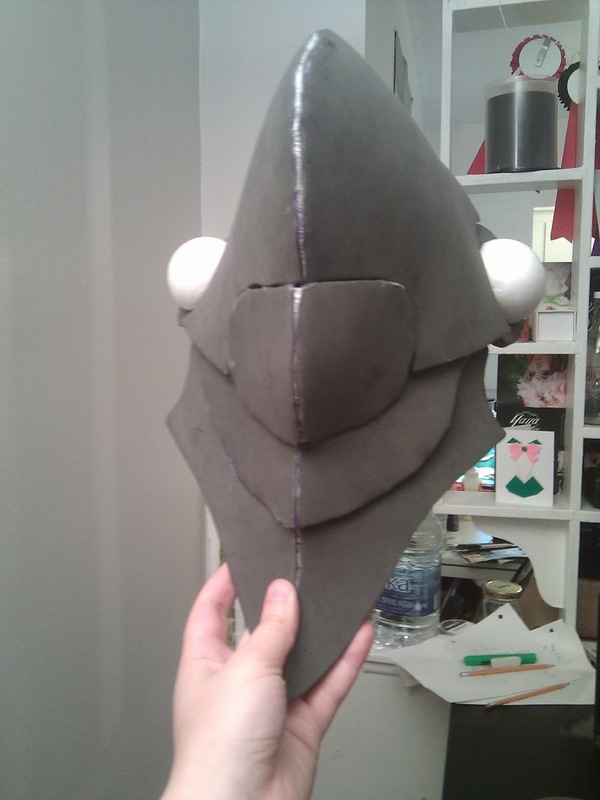 Once the final pattern was complete, it was cut from the craft foam twice. 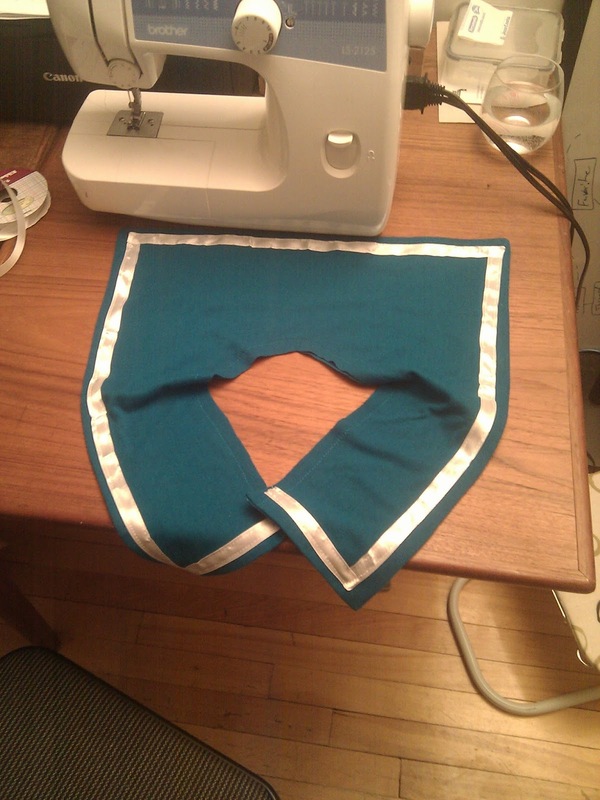 One of the copies was used to make the border of the cincher by cutting out the center of the foam piece. 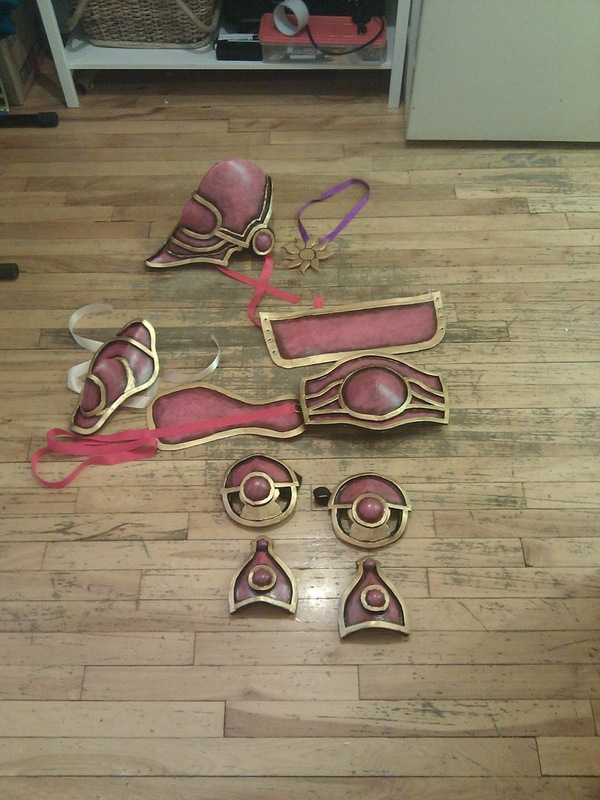 The two pieces were glued together and then painted in the same way as the pauldron was. Finally the eyelets were inserting into the opening and the whole thing was sealed to prevent the paint from rubbing on the rest of the custume (it did not work:S). Belt - The belt is composed of two parts, the armour portion and the cincher portion. The armour was made using the same methods that I used for the pauldron while the cincher part was similar to that of the actual cincher. I attached the two components using key rings and ribbon. The actual belt part was a singled ribbon that was glued to the cincher part and wrapped around the body to tie to the key ring on the other side of the armoured portion. Bracer - The bracer was a bit tricky to draft out, mostly because my friend's arm is a lot shorter than my own so I couldn't use my arm as a reference for the pattern. It was made from EVA foam and has gold ribbon attachments that just tie around the arm. To make it stay in place, industrial double sided tape was used to fix it to the skin. 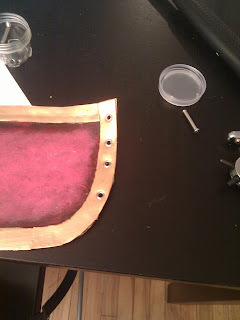 Knee Armour - The knee armour was fun to make simply because of the intersting shapes I had to cut out from the foam. They are held up with elastics in the back to prevent them from slipping down the boot covers. Sword - This was my first time making a sword so it was a large learning curve for me. I started out with a wooden dowel and insulation foam as a base for the blade. 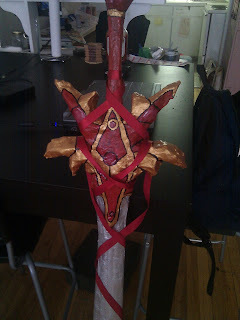 The base for the hilt was made using expanding foam that was then carved out in the likeness of the artwork. A couple of layers of papier mache were layed down, them it was primed with wood glue and gesso. The blade was painted using spray paints while the hilt was hand painted using acrylics. To finalize it a red ribbon was tied to it and draped carefully around the sword. This year I was able to attend two of the events organized by the Coticon committee! The first event was scheduled in early summer and was a complete outdoor event. Thank goodness we had great weather! It was a photo shoot type of event, where cosplayers and photographers mingled and had lots of fun derpy moments together, I was cosplaying as Mew Zakuro and I attended the event with my good friends Bandit Spurs (casual photographer), Tsuki no StarDust (Masked Lumen and Father Balder) and Tattered Tartan (kilt wearing photographer). Upon arrival I was greeted by a cute little Alice cosplayer (Pandora Hearts) who was so happy that I was cosplaying as a Mew. I'm pretty sure I made her day! 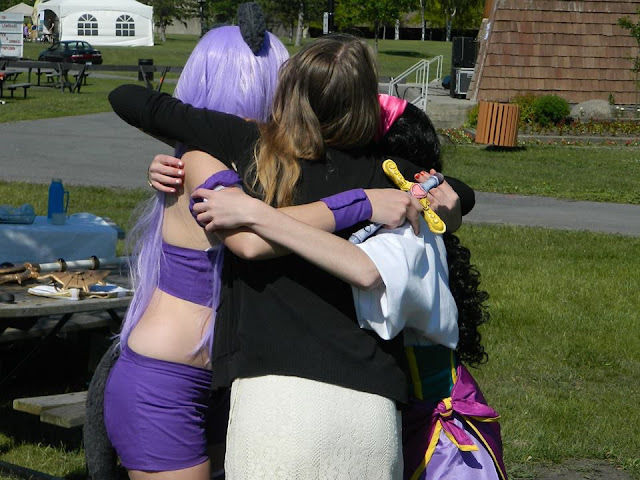 Anniechie of course was running around being an organizer and a cosplayer (Esmerelda) at once. Luckily organizing a photo shoot day doesn't need a whole lot of supervision so she was able to partake in some of the photo shoots that happened. We spent the whole afternoon at the event, made some new friends and enjoyed a few derpy moments. 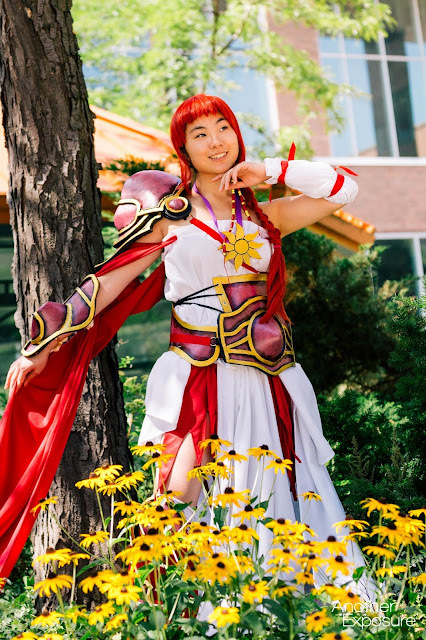 The second event that I attended was the actual convention Coticon 2015. Unfortunately due to my family having a last minute gathering the same day I could only attend for half of the day. I wore my Sakura Hime cosplay that day and surprisingly I didn't die of the heat, which is saying something as the convention was held in late August! The morning started off with Bandit Spurs, StarDust and I giving a cosplay 101 panel. It was my second panel that I've done but it was my first time being the lead of the panel. I think we did pretty well since we got an applause at the end of it! Right after the panel I joined up with Tsuki no StarDust, SawakoMio and Mizuki and Pheli for a huge Tsubasa photo shoot! We had lots of fun setting up the photos with the massive chair and derping around. All too soon I had to change and leave in order to get back to my parent's place for the family gathering. It was great fun, even if I didn't get to hang around all that much! I look forward to next year's Coticon and who knows, maybe I'll even make a more specialized cosplay panel!